Mac Pro Rackmount panel (EN) | PRO MUSIC, s.r.o. The Mac Pro Rackmount Panel features a modular design to connect all necessary devices into a 19” server rack mount environment. 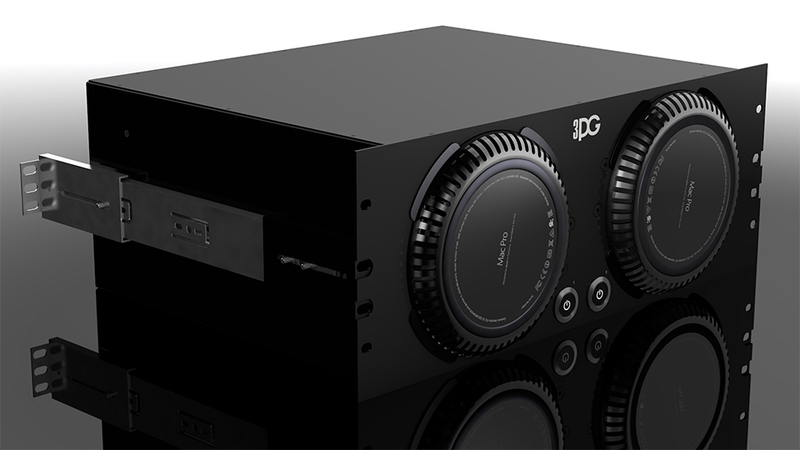 With optionally internal and external hardware modules the Mac Pro Rackmount Panel guarantees the greatest possible flexibility on the market. The Mac Pro Rackmount Panel is available with either one or two computer mounts preinstalled. Following the Apple usage guidelines for horizontally mounts of the computer and standard temperature conditions in a server rack environment the Mac Pro Rackmount Panel enable unrestricted airflow trough the Mac Pro. Within a transportable rack application and operations under different temperature conditions the Mac Pro Rackmount Panel even provides active cooling support. 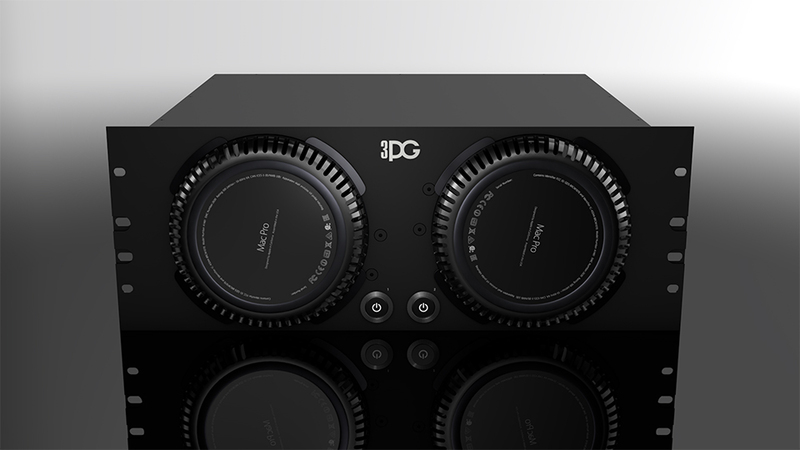 The panel features one internal 7-port active USB hub for each Mac Pro, powering all USB outputs to maximum level according to USB standards. The internal USB connector e.g. provides a safe place for copy protection dongles (thus effectively works as a theft protection for the precious dongle), Dual link Mini Display Port Adapter USB connectors to connect Ultra Wide HD Displays. An optional 4– or 8– port active DI-Box convert consumer 3.5mm phone jack connected audio signal of the Mac Pro to professional audio industry standard balanced XLR connectors. Back panel mount USB 2.0 USBCon, two EtherCon CAT5e and one front panel mount USB 3.0 port for each Mac Pro connect ports of each Mac Pro for convenient external connections. Due to not any existing panel mount connectors for Thunderbolt, the split cable entry frames allows inserting of several cables up to 17 mm diameter each and strain relief for each cable, like Thunderbolt or active Mini Display Port Adapters. PowerCon input and output connectors for electrical power supply and link to other devices. The mounting module hold the Mac Pro firmly in place without marring the mirror finish and includes Thunderbolt cable lock for all 6 connectors on a Mac Pro that secures Thunderbolt and MiniDisplay Port connectors plugged into the Mac Pro whilst transport. Telescopic slides allows easy and secure mounting in 19” racks. The Mac Pro Rackmount Panel is the perfect solution for use in several rack applications. 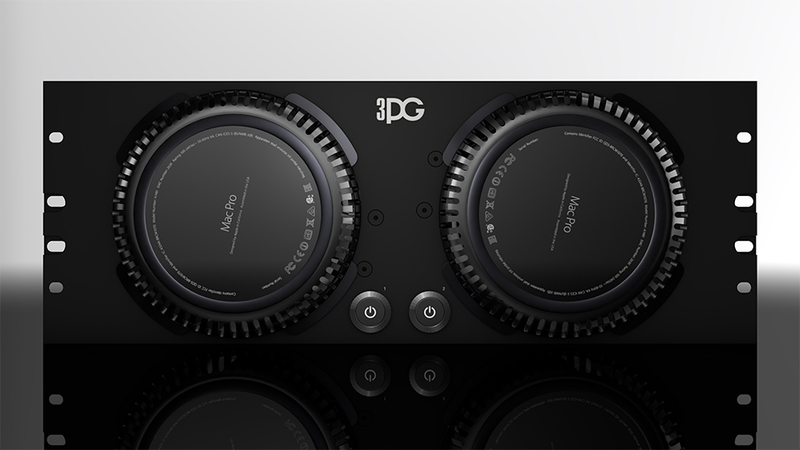 With the additional available 19” Thunderbolt Expansion Hardware Panel for up to 6 PCI-express full length slots and 19” Server Panel range for different connectors, like Dual-link DVI, USB, 10Gb/s Ethernet ports the Mac Pro Rackmount Panel guarantees the greatest possible flexibility on the market . 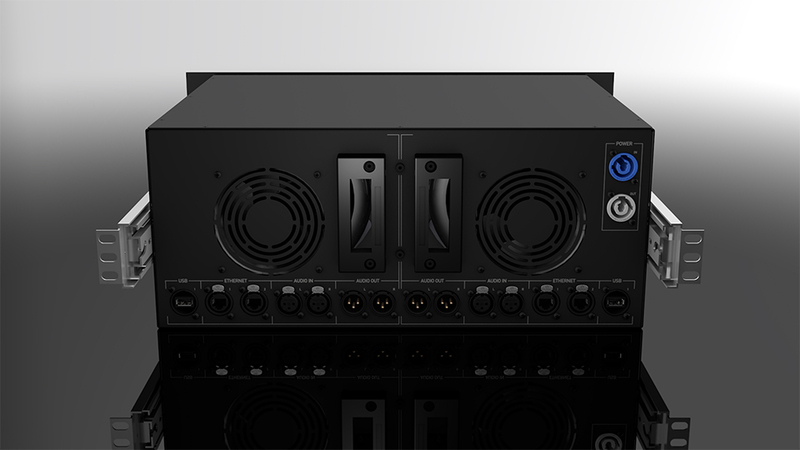 The NEW Mac Pro Rackmount Panel is available for Pre-Order, please contact us using our contact form. Mac Pro®, Apple®, and Macintosh® are registered trademarks of Apple Inc.. The Mac Pro Rackmount panel is intended for both rental/road and installation purposes.